Quizlet is a website where users can create, share, and study flashcards. Users can make a study set on the internet and then study them on a computer or using the free Quizlet iOS app. The app is compatible with iPhone and iPod touch. Teachers can also make a study sets for their classes. Quizlet also offers pre-made flashcard sets for popular vocabulary books, SAT vocabulary, and more. Flashcards can also include images to aid in studying. Once the study set is open you can view the terms in list mode or in flashcard mode. Watch the video above to learn more. Both modes include speak buttons which speak the terms in a high quality text-to-speech voice. Quizlet is compatible with Apple's VoiceOver. Click here to download the free app. An iOS app called TapTapSee can recognize almost anything that you can take a picture of. TapTapSee is designed for the blind or visually impaired so it requires VoiceOver to be enabled. Click here to download the app for free. With the app open simply point the devices camera at an object and double tap to take a picture. Then TapTapSee recognizes the image with amazing speed and accuracy. In my tests the app was able to distinguish a salt shaker from and nearly identical pepper grinder. The app took an average of 10-15 seconds for each image. Keep in mind that you will need an internet connection for the app to work. With a few exceptions TapTapSee recognized everything that I took a picture of. The app is truly amazing because of its accuracy and detail it is able to provide in a short time. Visually impaired users could use the app to distinguish between two similar feeling objects. The app can also recognize all denominations of US currency but unlike the LookTel Money Reader TapTapSee cannot recognize foreign currencies. TapTapSee is also much faster than competing apps such as VizWiz. TapTapSee is a perfect addition to any iOS device for vissually impaired users. Click read more below to view the app in action. Angry Birds maker Rovio Entertainment Ltd. in cooperation with DreamWorks Animation has released The Croods, a free game for iPhone and iPad based on the upcoming motion picture. Players must trap and tame 10 pre-historic creatures, including the Girelephant and the Molarbear, create inventions with Grug to open and explore new areas, and decorate their world with caveman accessories. How can you already have a favorite character from The Croods? The film isn�t even out yet. The game is free to play but it does come with some paid goods inside, so be careful with that in-app purchases toggle when you give your iPad to the kids. Also, Rovio asks customers to note that the game requires a network connection to work. It�s also chock-full of third-party ads. Yep, not exactly an ideal gaming experience. But we�ve come to learn that about Rovio in the past year. The good thing is that The Croods runs on pretty much all iDevice models. It only requires iOS 4.3. Google's popular Google Now feature may be coming to Apple devices if a leaked video is to be believed. Google Now is currently an Android exclusive feature but Google has brought flagship Android features to Apple devices in the past. One example is Google's advanced voice search that came to iOS last year. Google Now has predictive cards that provide information to users automatically. The cards gather information about a users search history and provide useful information automatically. Engadget.com was sent the video which was later taken off YouTube. The leaked video is visually similar to other Google promotional videos with lends credence to its authenticity. If the video is legitimate Google Now would be a great addition to Apple's mobile devices. Click read more to view another video about Google Now. Google's social networking site Google+ has made news again for its Hangout video chat feature. This time for providing a new window to the world for people with disabilities that make traveling difficult or impossible. A growing number of photographers are providing videos of different landmarks and attractions. These are not just stagnate videos, users can communicate with the photographer and ask them questions in real time. Also, multiple users can participate in a single session. This feature could also be used to allow people with disabilities to virtually attend a sports game, class, concert, or play. Watch the above video to learn more. While video chatting has helped deaf users communicate with each other, conventional video chatting runs into problem when an interpreter is involved. Google is attempting to solve this problem with its sign language interpreter app for Google+. Google+ is Google's social networking service. 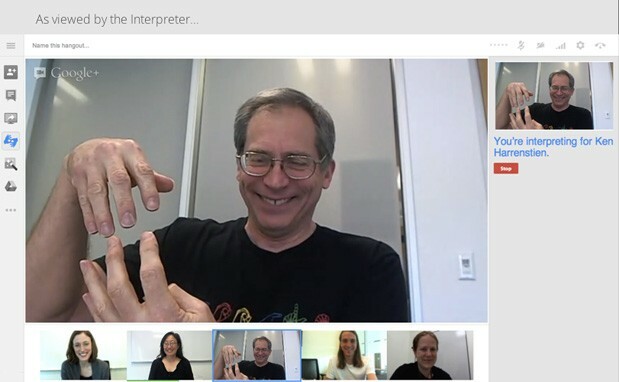 Google+ Hangouts now supports sign language interpreters for deaf users. With the app installed the deaf user sees the interpreter in the top right corner of the window. When the the interpreter speaks for the deaf users, the app recognizes who is speaking and then makes the speaker the focus of the Hangout. It is encouraging to see Google vigorously improving the accessibility features in Google+. We�re just over a week away from the Galaxy S IV�s official unveiling in New York City, and the pieces are starting to fall into place. Sure, we still don�t know what the thing is going to look like, but persistent rumors have pegged the device as sporting the same sort of plastic body that Samsung has been (in? )famous for. While she wouldn�t weigh in on the Galaxy S IV specifically, Y.H. Lee, executive VP of Samsung�s mobile unit that the love-it-or-hate-it plastic chassis endemic to the company�s gadgets aren�t going anywhere just yet. According to Lee, it�s just as much about practicality as it is about style: In order to churn out (and sell) as many devices as Samsung does, the company has to pay plenty of attention to how efficiently they can be made. Naturally, Samsung can�t just pump out loads of shoddy devices and call it a day, so durability weighs heavily on the company�s mind when it comes time to picking out materials for a final design. Meanwhile, would-be rivals like HTC have embraced metal with open arms in its latest flagship device designs. The benefits are as plentiful as they are subjective � the adjective that seems to be bandied about most often is �premium,� since these metal-clad devices tend to feel more weighty and substantial when compared to the sorts of flimsy plastic bodies that many Android-friendly OEMs still cling to. I�ll be the first to admit that I prefer handsets that feel like they could withstand some abuse, though in fairness I�ve found that devices like the Galaxy S III and the Galaxy Note II can handle their fair share of turmoil despite having light, plastic bodies. Granted, I can see how the choice of materials could prove to be occasionally problematic for the companies involved here. Crafting a device like the HTC One or an iPhone 5 out of aluminum can be more exacting (and therefore more time-consuming), not to mention more expensive than sticking with a less ornate body. But here�s the thing � Samsung doesn�t need to play by those same rules. It�s an undeniable juggernaut in the smartphone space, and has proven ably over the past months and years that yes, people will often buy their smartphones even when faced with alternatives that arguably feel more premium. That�s not to say that Samsung will never rethink its position on the materials it uses. Lee concedes that the company �listen[s] to the market� and tries to accommodate it, so that sentiment could soon change if the masses demand it.